Already in January the only privately funded Euro 2016 will open its doors. The new Lyon arena is almost complete. 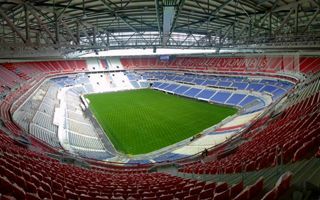 Construction works are almost done at Stade des Lumières, the largest stadium of Euro 2016 that hasn’t been opened yet. Just as UEFA’s deadline requires, the venue will be launched into operation early into 2016, six months ahead of the tournament. Already now the stadium seems complete apart from details. The field is lit artificially to improve its growth in autumn, all 61,000+ seats are installed, the roof is complete and glass outer cladding is almost entirely installed. Works are still ongoing inside the stadium, including concession stands and promenades. The €405 million project ($428.5m) will be handed over as planned, by the end of 2015. Already in November ticket sales for first events of the new year began. On January 9 Olympique Lyonnais will play against Troyes, while on January 24 the legendary Olympique Marseille is paying a visit. Of course apart from league games Euro 2016 will see the stadium taken over by UEFA from May to part of July. Aside of football there also are other big events to look forward to. Before Euro 2016 begins, the stadium will hold Challenge Cup and Champions Cup finals (rugby). First concert was confirmed for July 19, seeing one of four Rihanna’s performances planned in France. Below are some of the most up-to-date photos we could find and a small bonus – a stitched panorama of good old Stade de Gerland in its heyday. Soon memories will be all that OL fans will have left of this iconic stadium.